Editor’s note: June 6th, 6:45 pm (New York City time), turn on your computer and click here. This will take you to the Australian National Health and Medical Research Council (NHMRC) website, where you can listen to a live-streamed webcast of the following symposium. We recommend Dr. Mariana Alves-Pereira (one of the principal researchers on Vibro-Acoustic Disease, including VAD from wind turbines), Dr. Bob Thorne (an acoustician who has studied wind turbine noise), and Dr. Sarah Laurie (the Medical Director of the Waubra Foundation, dedicated to researching and addressing Wind Turbine Syndrome in Australia). The other speakers? They’re worth listening to, as well, although they may make your blood boil. All the speakers’ scientific and professional credentials are listed and more or less explained in this document. For Nina Pierpont’s scathing review of the NHMRC’s report on Wind Turbine Syndrome, click here. 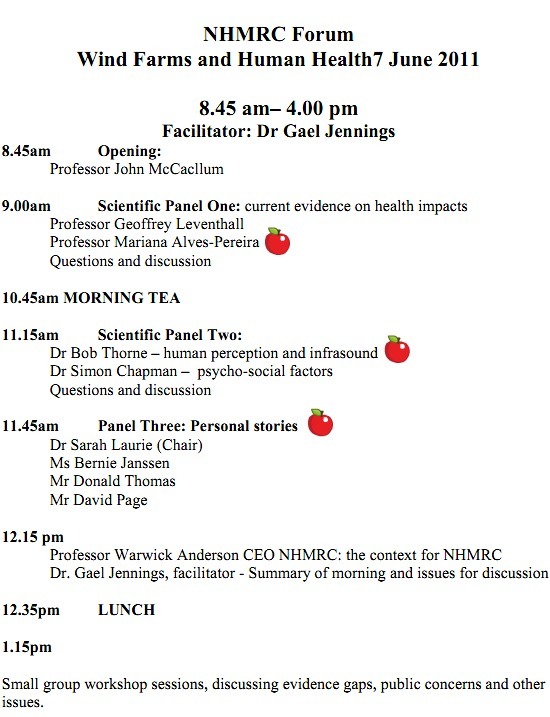 My guess is that this symposium is a fig leaf designed to cover the NHMRC’s backside for its scandalously stupid report. Yes, they invited some outstanding speakers—but will they be taken seriously? Were I a betting man, I’d say they won’t. My guess is the NHMRC will pretend to deliberate on the evidence, then announce they can find nothing “scientifically” sound about Wind Turbine Syndrome. And wind energy companies will be permitted to charge ahead with their projects—with the blessing of the National Health and Medical Research Council. Dr. Laurie disagrees with me; she’s convinced the symposium isn’t a sham.